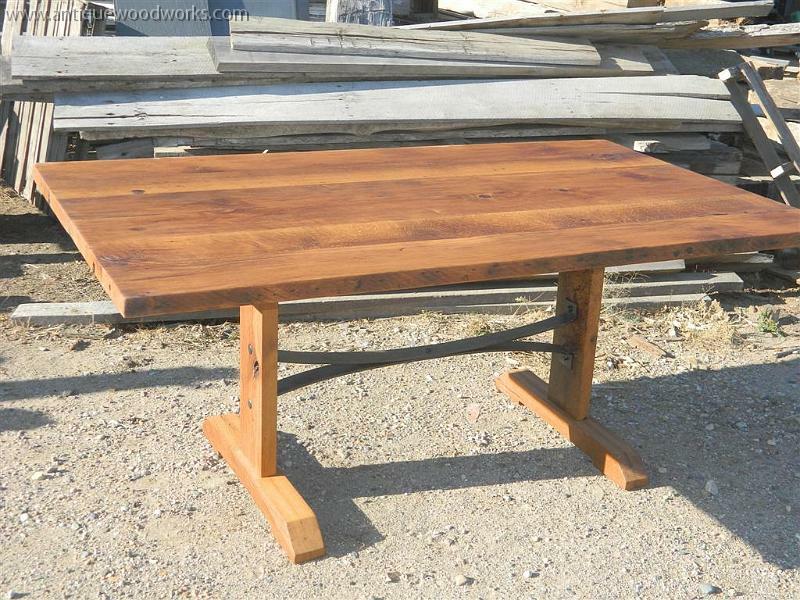 As with nearly all of our farm tables, we specialize in using the very best reclaimed wood. More often than not, we use reclaimed white oak because of the great color variations. White oak starts out as a wheatish-tan and develops deep coffee browns as it is exposed to ammonia in the environment. It develops a far more interesting patina than any other reclaimed wood. But you’ll also see that we use others such red elm, red oak, pine, ash, and black walnut. This table design, with two legs and a horizontal stretcher between them, is usually referred to as a trestle table. The basic design dates back to the Middle Ages and was refined in the 16th century. We are very fond of this style for two primary reasons: clean seating anywhere around the table as well as long-term stability and strength. When built well, a trestle table can be pushed and tossed around with virtually no movement — even without the top attached. Conversely, with legged tables, there is an incredible amount of leveraged stress where the leg is attached to the apron and table top. That’s where the H-Stretcher design in Farm Tables is a great idea. Tables naturally get dragged and pushed throughout their lifetime. With a legged table, this eventually weakens the joints. With a trestle table design, those stresses are just not there. Trestle table made from reclaimed white oak with iron accents. Top view show the wonderful wood color. This is natural and not stained. 12 foot reclaimed red oak dining room table. Stretcher on a trestle table with forge welded straps. Smaller trestle table with nice iron accents. Original old pegs re-used on the table. Ash trestle table with Antique Woodworks mantel in background. The ash was recovered from storm damaged trees on the customers property. 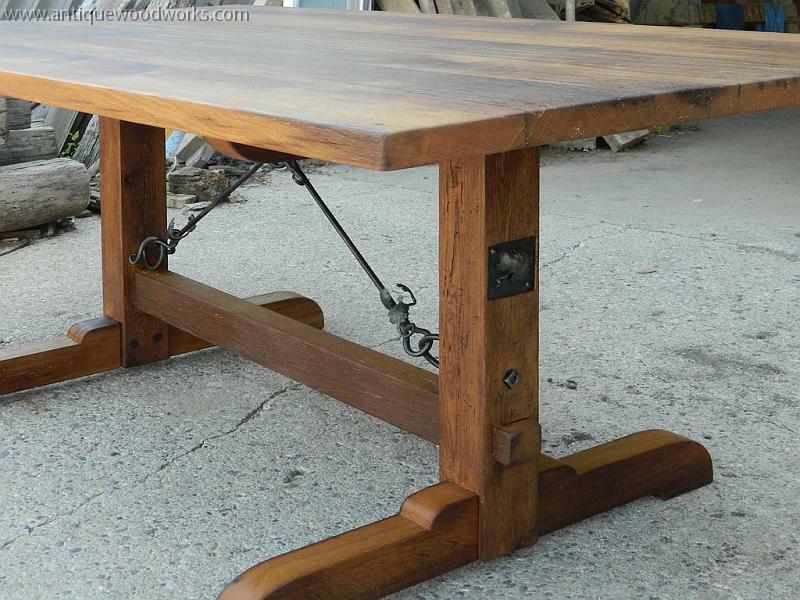 Reclaimed wood trestle table with stretcher inspired by a wagon’s buck board bench. 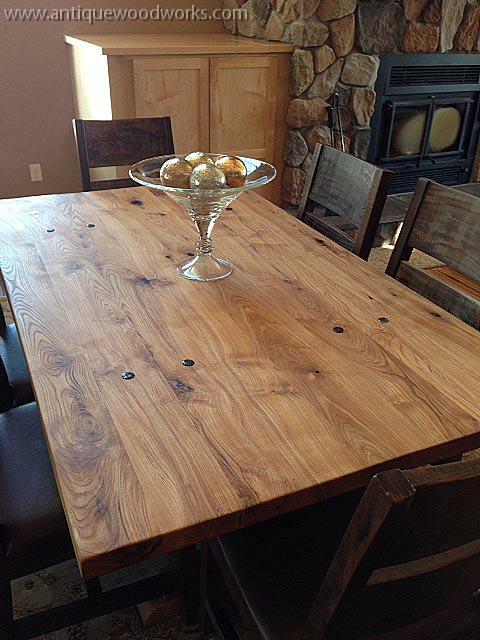 Close-up: Massive, heavy, original hand hewn timbers make this table a stunning centerpiece. 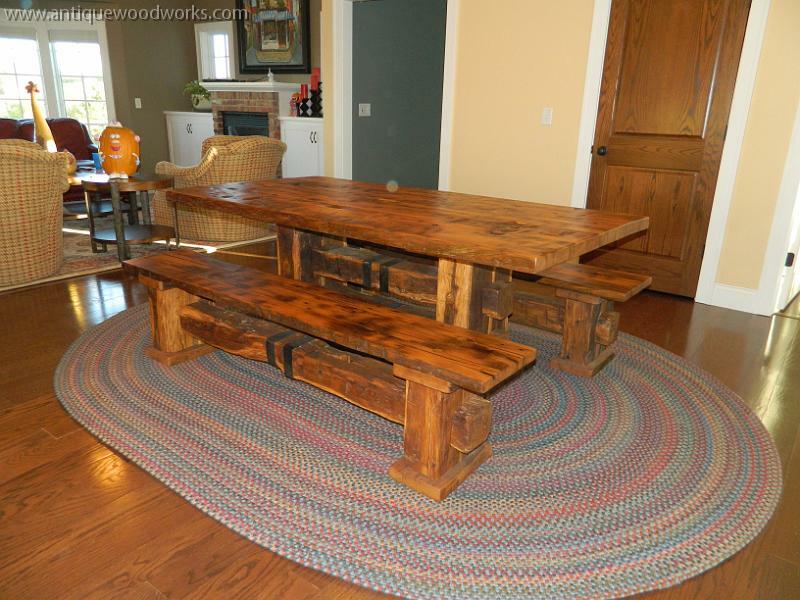 Massive, heavy, original hand hewn timbers make this table a stunning centerpiece. 40×78 farm table with hand hewn timbers from an old 1800s vintage granary. Hand Hewn top with lots of character as well. Close-up: A modern take on the bulbous style of the late 1500s. A modern take on the bulbous style of the late 1500s. A beautiful live edge adorns this table top. Heavy reclaimed wood top original cut from log cabin timbers. Heavy white oak table made from reclaimed floor joists. A hand hammered iron accent on the end, reminiscent of old industrial warehouse supports. 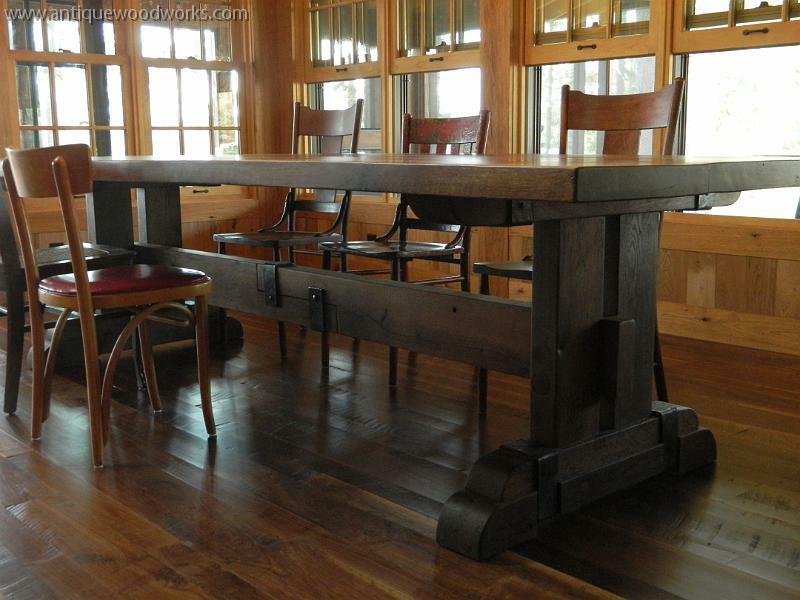 Original barn pegs re-used as functional pegs on this trestle table. A nearly 3×10 stretcher connects the legs together. An light, elegant trestle table with lots of reclaimed character. This table has hosts a lower stretcher and nice ironwork. Wrought iron, metal leaves, and steel hoops accent this table. Close-up: Metal leaves accent this table. Simple, red elm, shaker style table with little iron accents. 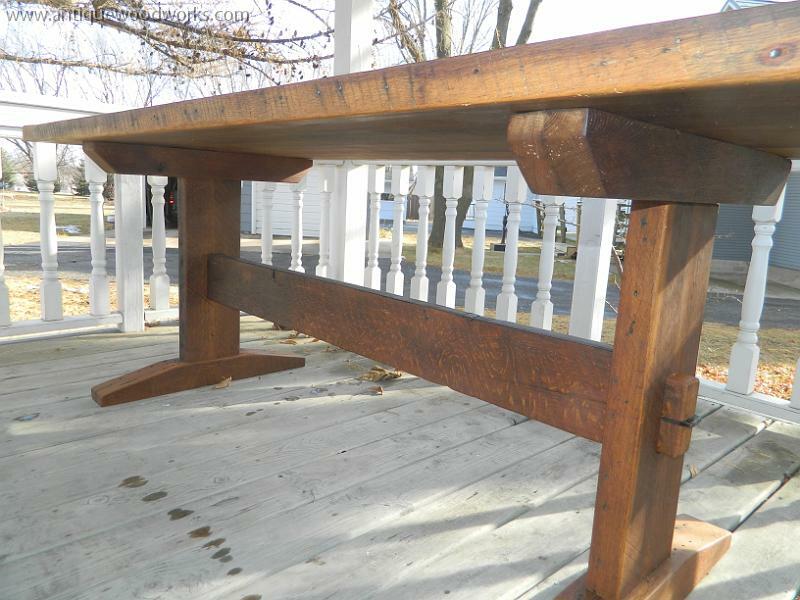 Shaker style trestle table made with Rock Elm, which is nearly unavailable on the modern market. Another View: shaker style trestle table made with Rock Elm, which is nearly unavailable on the modern market. Extensions add another 16in onto each end of this trestle table. Nice wood grains and circle saw marks reveal themselves on this reclaimed wood table. Little trestle table made from reclaimed white oak wood. A set of 3 went to a restaurant in the New York area. 36×48. Beautiful character naturally found in this old wood. Small farm table. All of the joiner is true mortise and tenon. Hand hewn top with quite a bit of character and variability on the surface. Tree-like edge on this reclaimed wood top. Legs are made from the rafter poles of an old 1800s barn. Close-up: Tree-like edge on this reclaimed wood top. Table base made from tree-like rafter poles from a 1800s vintage granary. Lots of character on this reclaimed wood top. Hand hammered bolts to attach the top. Great color range on this reclaimed white oak top. Close-up: Amazing workmanship from a real blacksmith hammering out 3/4in x 3in curves to bring the table together. Collapsed table at 48in x 7ft. Close-up:Reclaimed White Oak Farm Table. Starts at 48in x 7ft and expands to 48in x 15ft. Reclaimed White Oak Farm Table. Starts at 48in x 7ft and expands to 48in x 15ft. 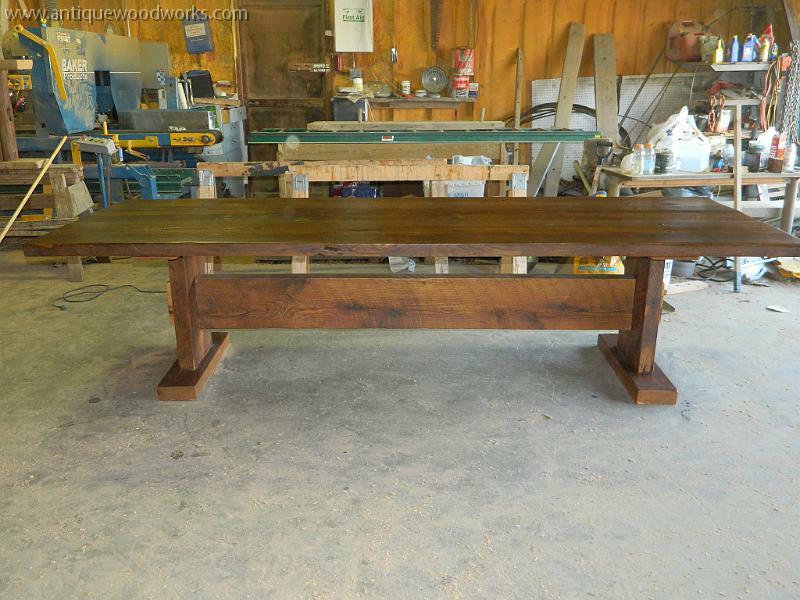 Reclaimed wood farm table with original tenons from the original granary joists. Original edge typical of our work. Nail holes and character. Trestle table with little metal wedges to keep the stretcher in place. Original granary with 2×6 oak studs, mortise and tenoned into the larger beams. Matching bench design to tuck in nicely around the table. The pedestals on this table are large beams from an old log cabin. Metal silo band accent each. White oak trestle table with mixed patina top. Pretty heavy feet on this one. The table top is two – 16inch Red Oak slabs. They are bookmatched pieces on the backside. Pretty neat table. Lots interesting features. White oak uprights made from a log cabin timber. They have lots of weathering and color variation. You can see the deliberate, slight gap in the left center. You can also see a patch that was wired together. While white oak is our forte, we do some pine as well. Rustic Trestle table made with ash. Top planks joined by full through bolts. Little iron accent on the trestle. Metal straps accent the top surface of this old table. Reclaimed white oak table with benches.